This book compiles and explores cutting-edge research in degenerative skeletal disorders, such as Duchenne muscular dystrophy and congenital myopathy, and new stem-cell based therapies and gene replacement therapy. Twelve expertly-authored chapters navigate the nuances of these treatments in an array of contexts and biological systems. The topics covered include: How are urine cells from a patient with Duchenne muscular dystrophy transformed into beating heart cells? What can reprogrammed cells tell us about heart muscle failure? What do gene mutations mean for those born with a muscle disease? How are manufacturing methods applied to human stem cells? Does therapeutic exercise benefit those patients who receive engineered limb muscle? Is there practical advice about nutrition to enhance muscle function for the Duchenne patient? Can microRNAs be useful to regenerate diseased muscle? 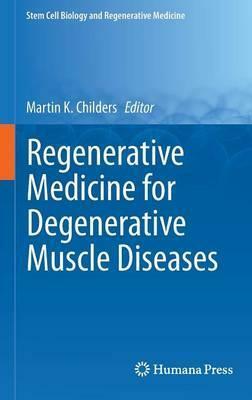 Regenerative Medicine for Degenerative Muscle Diseases is ideal for scientists and clinicians from varying disciplines in genetics, cell biology, virology, cell-based manufacturing, rehabilitation medicine, nutrition, veterinary medicine and neurosurgery. The reader will see how transformative changes occur in medicine that can powerfully impact the future for patients suffering from inherited disorders affecting muscles of the body, including the heart.